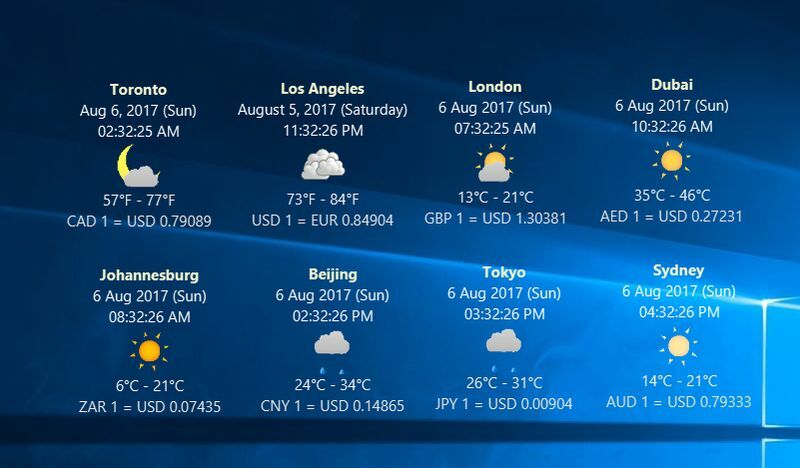 magayo WET is a weather app with animated weather icons, currency exchange rates and world time for your Windows desktop, whether at home or at work. It displays the local date & time of your chosen cities, the local weather with animated icons and the currency exchange rates. magayo WET also provides 5-day weather forecasts, the historical currency exchange rates, time converter, currency converter and temperature converter. You can further configure and personalize the look and feel of every element for every location displayed. You can easily change the font family, font size, font color, date format, time format, weather icon style, temperature unit, the currency to convert to and the amount to convert to. 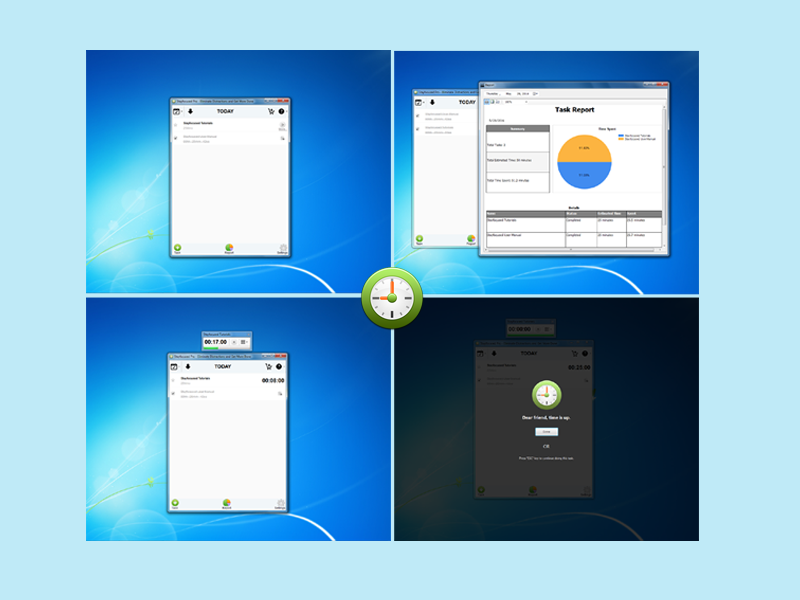 Multiple users sharing and using the same Windows computer can set up and personalize their own locations to be shown in their Windows desktop. Arise is an iTunes-enhanced scheduling solution. Perform a variety of tasks such as playing iTunes, sending e-mails and text messages, timing events, showing system alerts, and executing system tasks. Arise is ideal for both home and business users who are geared for increasing their productivity or organizing their schedules. Easily performing simple tasks such as waking up to iTunes or reminding the user to take medications at a specific time of day, to more complex operations such as taking web cam and screenshots of office computers and having them periodically e-mailed to an administrator! Alarms in Arise can be scheduled on an hourly, daily, weekly or monthly recurring schedule. For example, an alarm to ring every Monday, the 15th day of every month, 15 minutes past the hour, or at 9am every day. Countdown timers can be created that run at specific intervals. Also, an unlimited number of stopwatches can be created as well; useful for logging anything from time on a project for a client to speeches. Sitting quietly in the user’s menubar until it is activated, Arise will wake or startup the Mac if an alarm will ring in the near future. For Pro users, Arise can utilize the power of the system command line or AppleScript to execute system tasks in the background. For many people, time is the enemy, we race against time to complete tasks and meet deadlines. So Stayfocused is you choice, A simple task time-tracking tool keeps track of the time that you’ve spent on each of tasks and helps you complete each of them on-time. The idea of Stayfocused is based on The Pomodoro Technique. The root of the idea is that you work for 25 minutes straight and then break for 5 minutes. What can Stayfocused Pro do? — Manage Task: Create / Edit / Delete / Starred your task. — Redo Task: Redo task needed on any-time you want. — Break Reminder: Show Message for having a break after did work for 25 minutes. — Launch Applications: Choose any applications needed to complete your task. — Open Sites: Open any websites needed to complete your current task. — Open Docs: Open any pertinent documents in their default applications. — Hide Windows: Hide the windows that are unnecessary to your tasks. — Hide Icons: Hide desktop icons to help you increase productivity. — Set Wallpaper: Set a nice wallpaper to help you eliminate distractions. — View Report: View the report that shows how you have spent your time. — Set Timer: Set timer for x minutes you need to complete your task. — Play Sounds: Add a sound alert to remind you that time is up. — More Who does Stayfocused work for? –WRITERS: Motivate yourself to write. Keep track of how long you’re spending brainstorming / writing / revising. Reduce back and neck pain by walking around during Pomodoro breaks. –LAWYERS: Kill multitasking urges in the office. Get reports finished on time. –DEVELOPERS: Immerse yourself in programming, confining emailing to one or two Pomodoros a day. Break large, demanding tasks into shorter steps. Separate time they spend developing and refactoring. Reduce amount of bad code. –STUDENTS: Write papers. Track assignments. Route Planner is a Course and Distance calculations program and Waypoint editor. Production of a passage plan prior to departure is a legal requirement. Route Planner assists in the preparation of passage plans by allowing you to prepare, calculate and print full featured passage plan. A very quick and easy to use program, full of invaluable functions. Route Planner is a part of Maritime Software Suite along with Draft Survey and Lashing Calc marine programs for Ships Officers and Marine Surveyors. Garden Organizer is the best way to organize and manage garden chores, activities and all other related information. 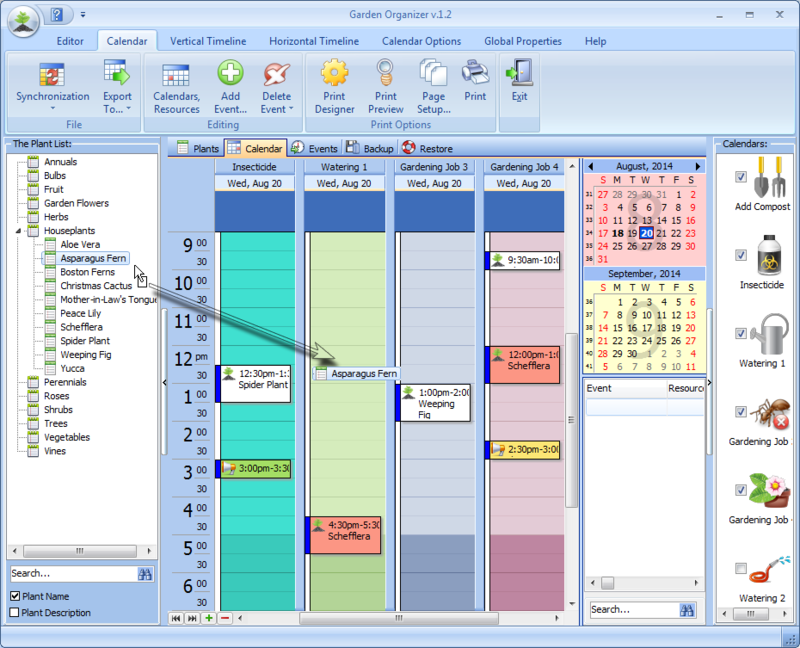 Those who are not expert in using computers for the management of their personal garden or their garden business can easily benefit from the intuitive and easy interface of the Garden Organizer. The software offers ready to use solutions for all garden management related organization and is very easy to use., The software allows the provision of cataloging all your favorite plants in the software with their names, attributes, any special or general description, specific maintenance notes for every plants and even their pictures, besides several other related things. The software also allows storing of information pertaining to different garden solutions and even maintenance of notes relating to your desired landscape design or any common gardening problem that you encounter often. The software is exceptionally useful for the organization of gardening projects and their regular maintenance tasks along with organization of other contacts related to your garden. Through using the Garden Organizer you can also line up and organize all web garden resources including the best internet garden resources. Not only is the Garden Organizer an easy to use and simple software that tremendously helps in managing all garden affairs rather it is one source that proves itself efficient and effective in meeting all challenges relating to garden journal entries, track of all plants, and management of graphic landscape design as well. The software also comes with a built in scheduler that allows perfect management of time and appointments in an efficient manner to make things more convenient, the option of dragging and dropping plants on convenient time slots is also available in the program making it convenient to make and remember appointments. Also those individuals who require converting their entire graphic and text data into HTML can do it using the feature in the Garden Organizer. The program also offers the benefit of synching exported data in it in several different formats including XML, TXT, XLS, HTML and iCal making it convenient to adapt to several other programs. The feature of auto search and auto field filling of a plant is also available among those present in the database. Viewing daily expenses aggregately or on a day to day basis is also possible whenever you require it. The program can also print out instantly whatever information you want from within the program. LAVClock is the multifunctional astrological digital clock that increases the possibility of standard clock Windows. 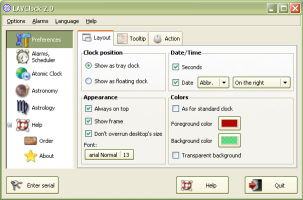 Clock can be in a taskbar or on a desktop. The universal alarm clock allows to set any schedules, what you only can think up. The time of start of the alarm also may depend on the astronomical occurrences. At start of an alarm the various actions can be executed. (message; sound; start of the program, including in the hidden status; turn off the system etc.). Automatic update your local PC with the exact current time will be cares of your clock accuracy. LAVClock will show your individual astrological forecast at nearest some days that is calculated on the basis of your date of birth and current time. For the horticulturists the lunar calendar for plants is built-in. You can visually see the current position of moon, sun and planets on the sky; you can find out the nearest new moons, full moons, lunar days. The moon is shown in that phase, in which is in your place now. Also you can see the time of rise/down of the moon and sun, duration of day and other astronomical features. Easily organize your schedule with events, tasks, and notes. These items can be linked with contacts or other items, helping you to keep track of not just your schedule, but also the data that goes along with it. 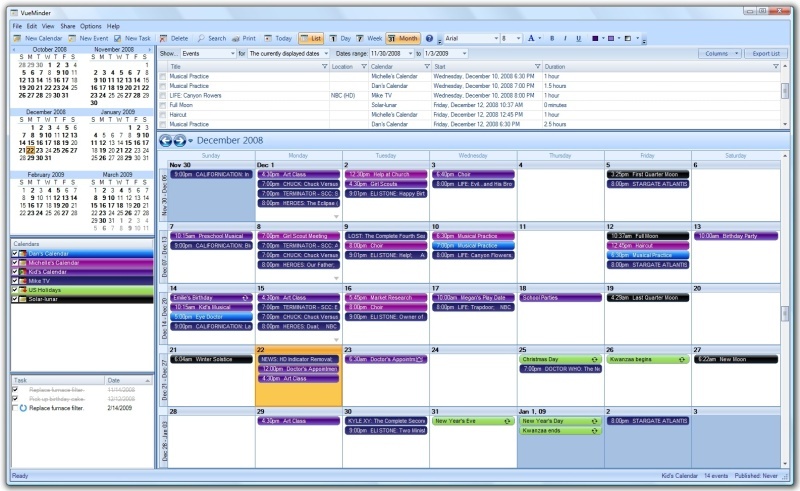 Events can be shared over a LAN or synced with Google Calendar and Outlook. Reminders can be configured to pop-up and be sent via email/SMS – both to yourself and others. 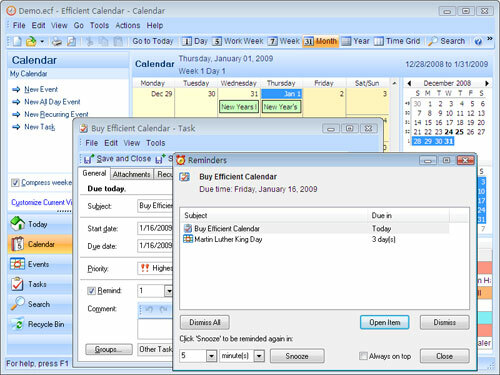 Various calendar views and lists provide easy data visualization. Efficient Calendar is a professional, elegant and easy-to-use scheduler, planner and reminder. It saves your time by allowing international holidays and major holidays of some countries to be imported directly. Multiple calendar views, such as Day, Week, Month and Year views as well as list view are available so you can better arrange and track your appointments and events. Events and tasks can be managed by grouping and differentiated by colors, so you can manage schedules in the most visual ways. The “First Thing First” principle is followed and you can set importance and priorities for events and tasks. By setting subtasks at any level, you can better organize and manage the to-do list. All appointments, meetings, events and tasks can be reminded in time as you configured, and you will never miss any important event! An important feature is the comments of events and tasks can be edited in the same way as Microsoft Word does. Besides, the software also provides various other unique features, such as adding attachments, Recycle Bin, displaying entry list in card view, etc. The interface of the software looks fashionable and cute. It has 8 interface styles of different tones of color for you to choose from! Begin to use Efficient Calendar now to help you manage time, save time and finally, control time, and you can go along a highly efficient, happy and successful road!